The plans for the market have been submitted to Thurrock Council. The plans are described by management company Outdoor Market Group as “An upmarket stall, outdoor market on Grover Walk.. to provide brand new, various sized stalls for anybody wishing to set up in business and sell goods and services currently not on offer in Corringham. “Our employees will look after the cleanliness and hygiene of Grover Walk on market days and all stall holders will have access to parking close to, but not in the existing free car parks around the town allowing for the extra influx of shoppers the market should bring in. However this has not gone down well with existing traders including Fullers butchers, Your DIY store and Classic Cuts who have all placed a poster in their shop windows. The poster asks: “Do you want noise every morning and evening? Has asked “Market=closing shops, loss of banks and post office. Think of Pitsea, Basildon, Grays and South Okendon (sic). 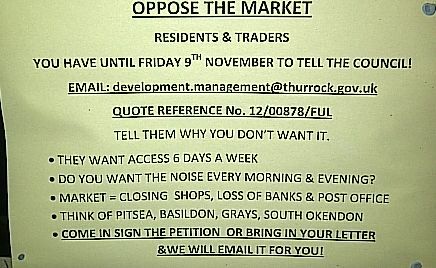 Concerned residents have also been submitting objections to the Thurrock Councik planning portal. The businessman behind the proposal, Andrew Wong from the Outdoor Market Group has expressed his frustration at the objections but is determined to see it through. Andrew said: “There is a lot of disinformation but we feel we have countered every argument. We have been totally transparent. We are adding to what the shops provide at the moment and are not running in direct competition. 2 Responses to "Corringham shops fury against new market plans"
How will having a Market that operates 3 days a week force existing banks, post offices & shops to close? as for the argument about Grays Basildon etc the market stalls have not forced any closures of the local shops and they add a new dimension to the shopping which gives customers more choice of goods and allow local enterprise to get involved.